The corroded chrome shower head, cheap fiberglass tub/ shower unit with the ugly plastic shower caddy hanging over the top in your grandmas’ house is the polar opposite of the trend in luxury showers you’ll see today. The Parade of Homes is a testament to that. 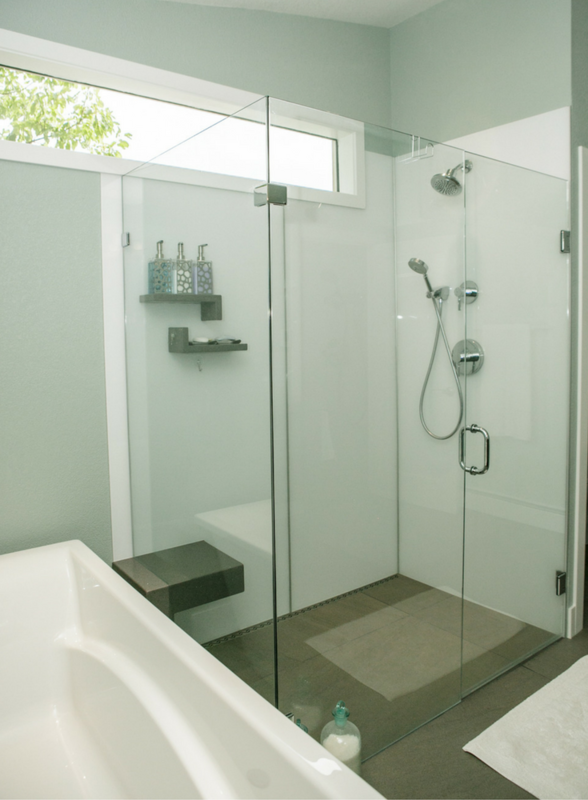 If you’ve got the bucks to spend, a large spa shower (and ditching the old tub/shower combo) is the way to go. You and I aren’t using the bathtub feature much (if at all) so the ability to take a shower which feels like you’re getting worked over on the massage table is WAY IN! I loved this example from Dani Homes. The heads and nozzles are coming out from everywhere! If you want a quick shower to get ready for work the stationary wall mounted shower head will be the ticket. If you want to sit down, shave your legs, the hand held wall extension will be just what the doctor ordered. To relax from a stressful day let the rain head do it’s thing. In general drains aren’t the coolest things in the world (with the exception of cool linear drains with lighting – although I digress). So why do you want to see a boring round drain cover in the middle of your shower. The team at 3 Pillar Homes decided to use a hidden drain. In this example the drain secretly disappears from view. Your eyes can now focus on your luxury walls – not an ugly drain cover. 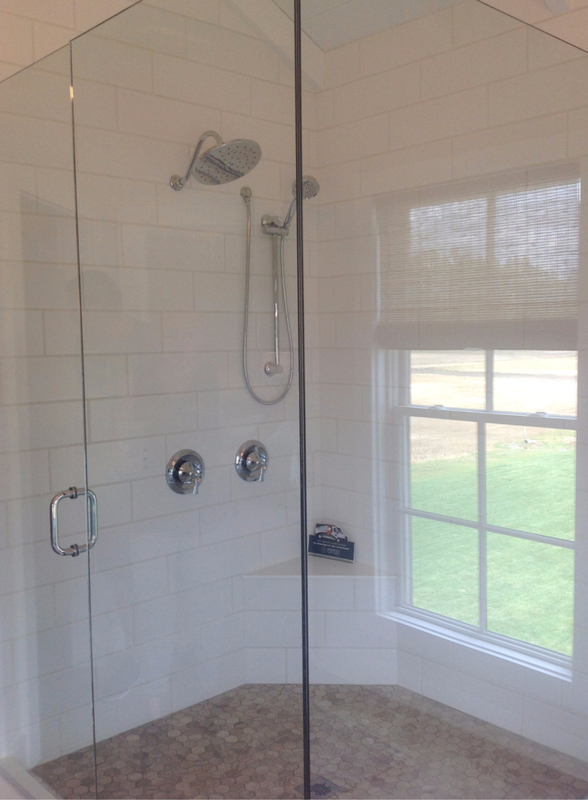 Shower Design Tip #3 – You can finally master geometry….at least on the shower floor! Geometry, trigonometry, calculus – do those words send shivers of pain up your side? Since you’re through with school now the punishment of math class is no longer yours to bear (for your kids – that’s another story!). You can now embrace geometry (at least the design on your shower floor). P & D Builders shower (shown in the first image in this post) was not afraid to add some pizzazz with a geometric tile shower floor pattern. Their ceramic and glass tile wall surrounds make for a bold blend of patterning. 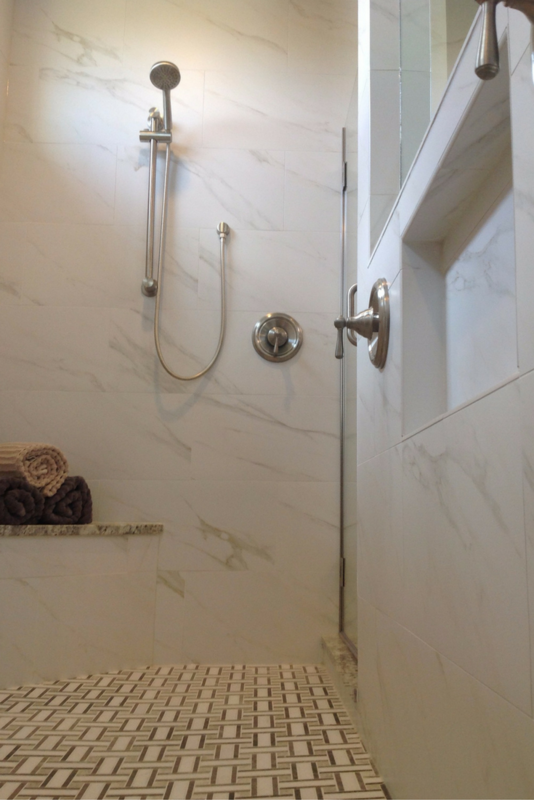 In the image below Memmer Homes used a contrasting color geometric pattern to provide contrast to the white tile shower walls. Guys – do you remember in your old bachelor days when one bottle of shampoo and a bar of soap was all you needed in the shower? Well those days are long gone after you got married. Now you have PRODUCTS in the shower. Tanning sprays, conditioners, scrubs, blemish control and exfoliating creams (exactly what the heck is exfoliation anyway?) are just some of the many items your partner will want to store in the shower. If you want to stay hitched (married) it’s best to get your shower “niched” (as in recessed niches)!” Tile shower are a perfect place to do this. In this Romanelli and Hughes home they used an interior wall cavity to create another spot for products to live comfortably. Since it’s on an interior wall you don’t see these products as you look into the shower. Nice idea! Vaulted ceilings give a luxury custom home a feeling of expansiveness. 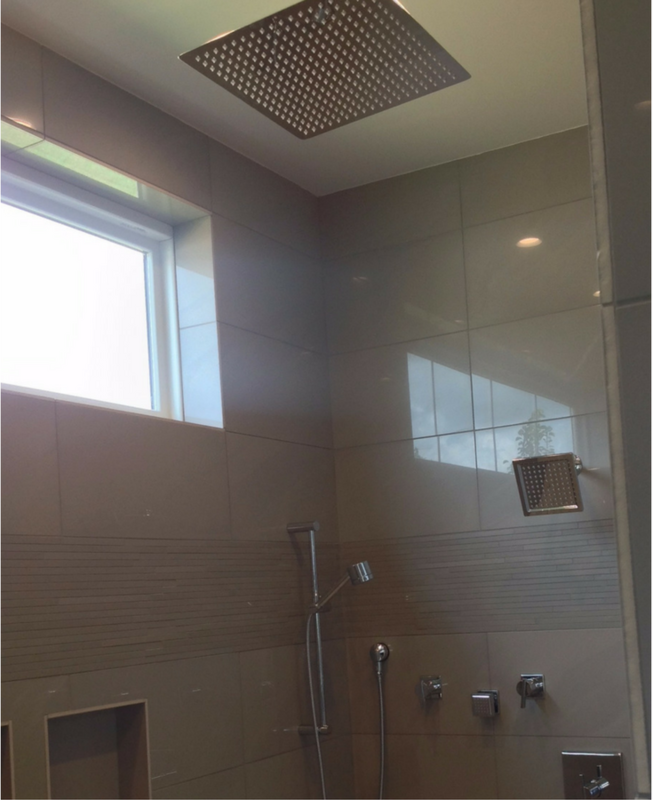 However, if you use a run of the mill standard height shower you end up with a big blank space above the enclosure. 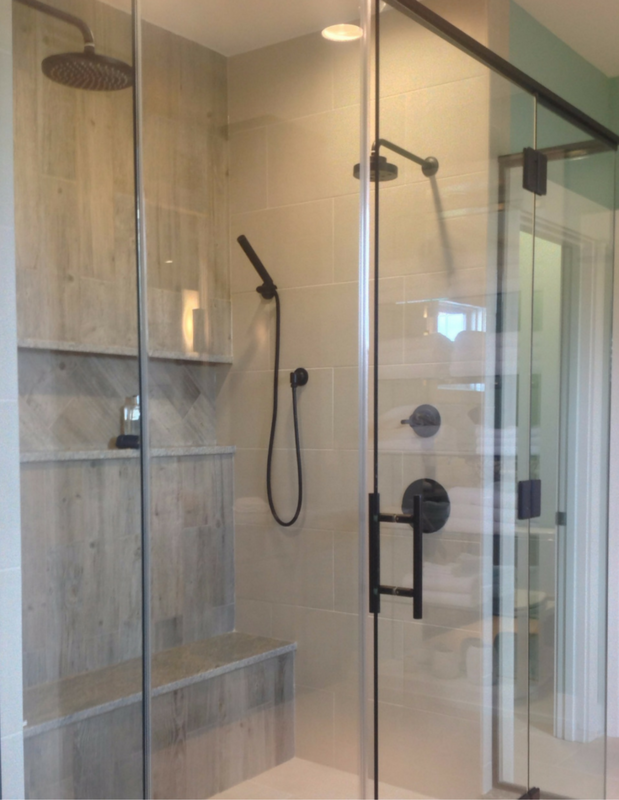 Sierra Custom Homes made the vertical walls of the shower a design advantage. A tile border was run vertically on the plumbing wall. The other surrounding walls were tiled up to the ceiling. 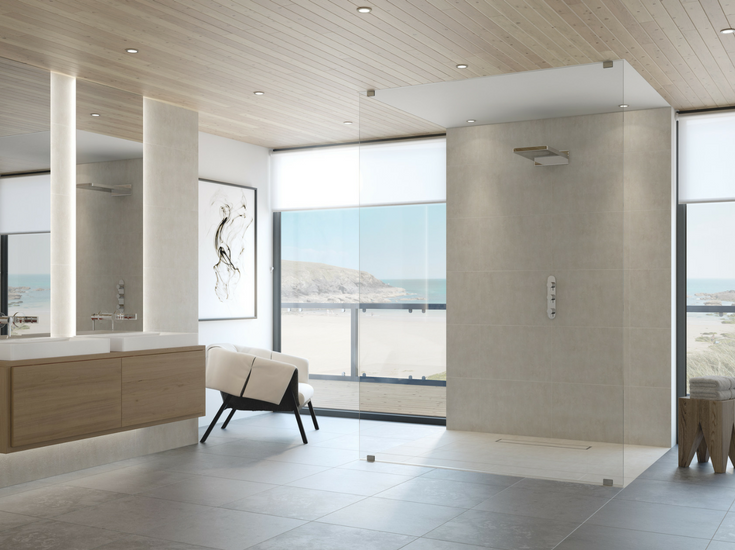 These wall treatments allow this luxury bathroom to soar. Boring is out – bold and daring are in! When many people design a shower they run the tile patterns in one direction and use all the same size tiles. While this can be cost effective – it’s also boring. Compass Homes does not believe in boring. I love how they laid tiles diagonally and built a shelf for storage of shower products (they must have read tip 4 already!). The oil rubbed bronze fixtures stand out in their boldness vs. the lighter earth tones tiles. Glass tile patterns don’t have to be a generic running bond (like the bricks on your house) pattern. They can be fun, and a bit whimsical. 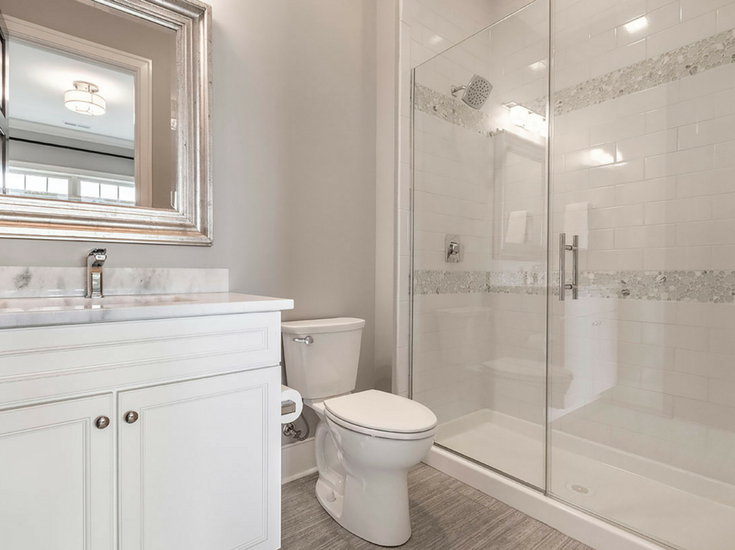 In one of the smaller bathrooms in the Bob Webb Parade home this fun circular glass tile design adds a nice touch of boldness around the calming white walls. One level bathrooms – We are not getting any younger even though I may think I am AFTER I use my $9.99 bottle of hair coloring (or at least that’s what I tell my wife!). I did not see is any bathroom design which makes it easier for people whose mobility may not be the best. What I’m seeing is hot in bathroom remodeling is one level (barrier free) bathrooms. Half the time people want them so they can stay in their homes longer, the other half the time it’s because they desire the same cool look they’ve experienced in luxury hotels across the world. One level bathrooms are safer and look cooler than traditional step over curbs. 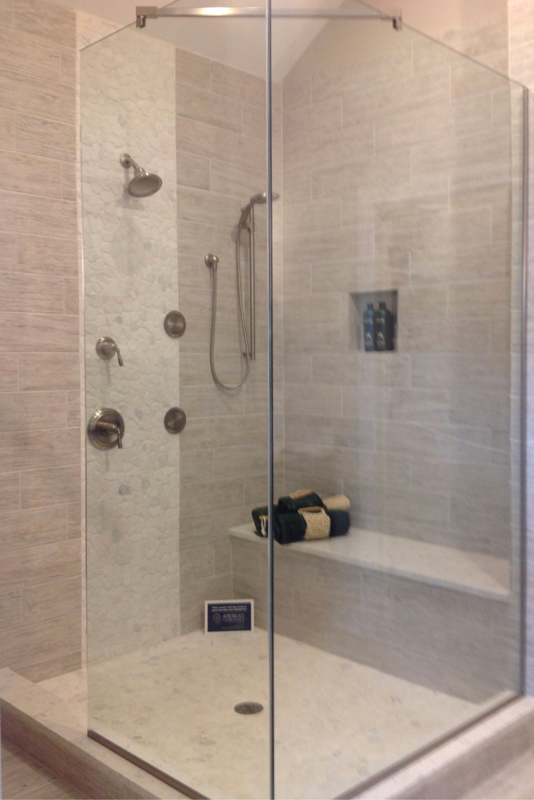 Grout free shower wall panels – I know people (and builders) in Columbus like to play it safe –doing what everyone else is doing. Since these Parade homes aren’t all pre-sold, they can become a very expensive marketing “asset” after the bloom of the show is long gone. So, while many people LOVE the look of tile they HATE the pain of cleaning grout joints. 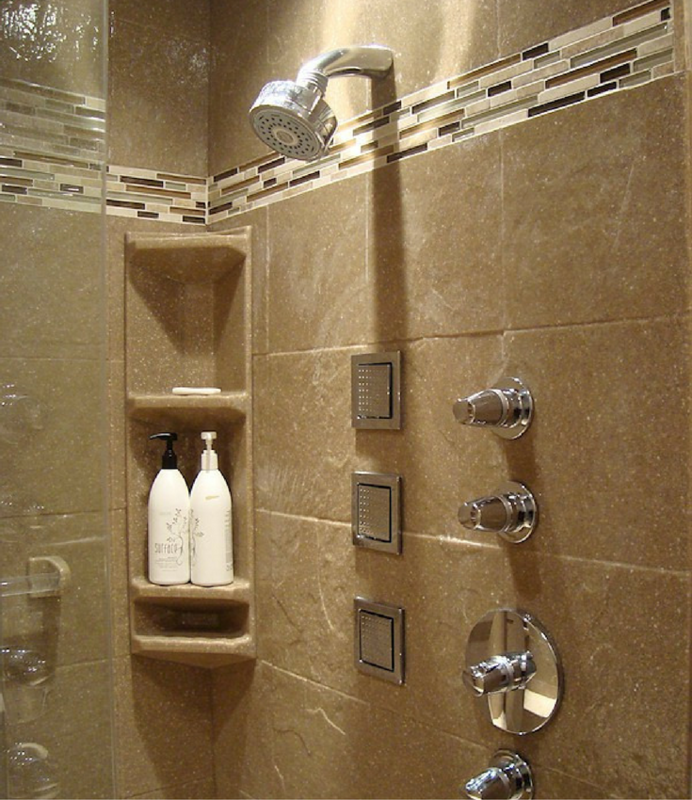 In remodeling grout free shower wall panels are HOT. Some are contemporary (like this high gloss wall below) and some are traditional (like these solid surface shower wall panels). Grout free solid surface shower wall panels with a glass tile accent border. 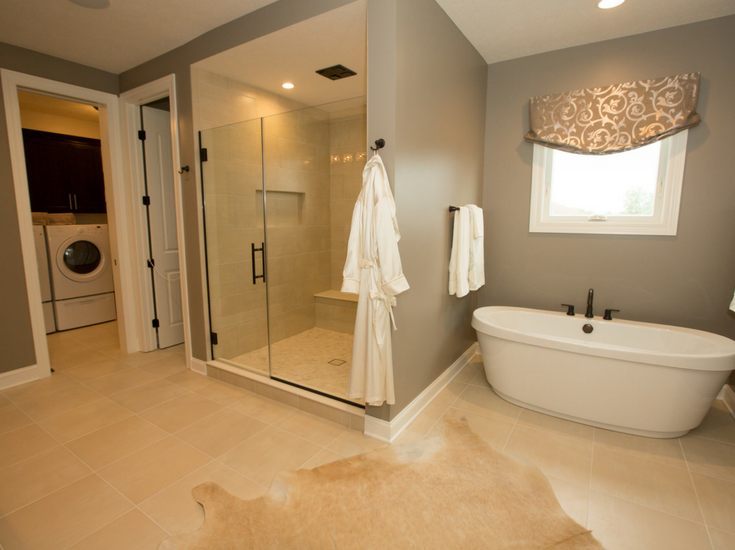 If you have time I highly recommend checking out this year’s Columbus BIA Parade of Homes. 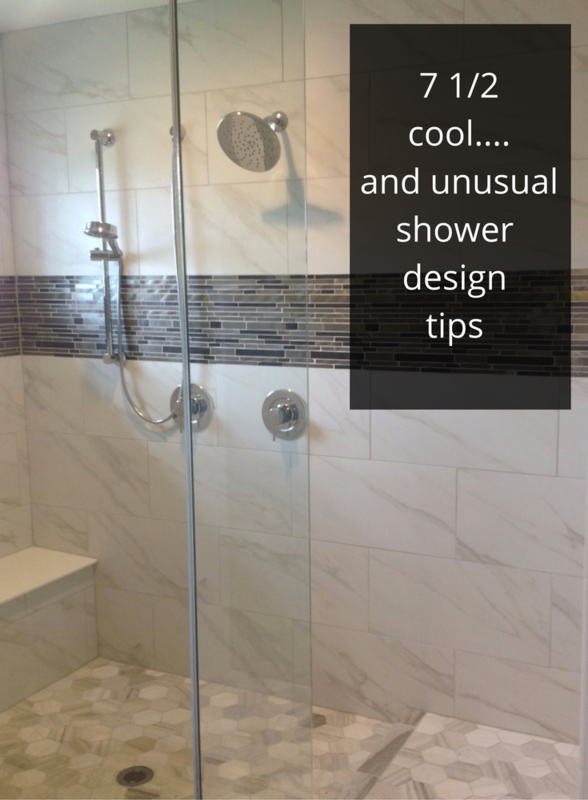 Even if you can’t make it (or you live out of town) I hope this article has shed light (and lifted your minds) to the possibilities and fun you can have with a distinctive shower design. Please comment below or call one of these excellent custom builders in Columbus (or my company – sorry about the shameless plug) for help building or remodeling the home of your dreams.